Mission: Impossible Fallout – the sixth in the series – is almost with us, and what better way to get yourself up to date with the goings on inside the IMF that pickup this new set of 4K steelbooks. Each one contains the film on a shiny new 4K disc, in addition to the previously released Blu-ray versions. Each is priced around £24-£25, but if you want all five, your best bet is to head over to Zoom, where you can get them all for £100 (and a big thanks to Zoom for supplying our review discs!). 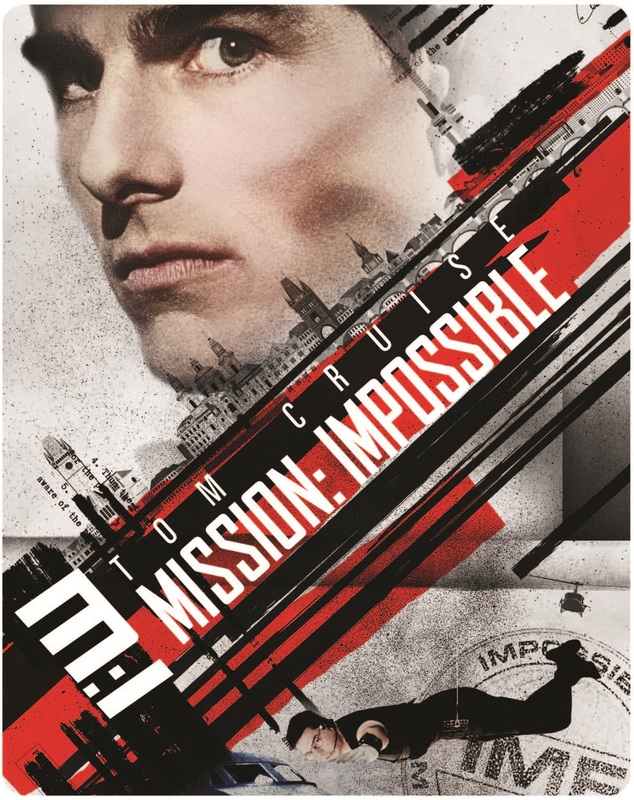 1996’s Mission: Impossible was a superb updating of the classic TV series. In the hands of veteran director Brian De Palma, we start out with an almost cliched, leisurely 70s style conspiracy thriller, as a team of agents are double crossed on a vital mission. 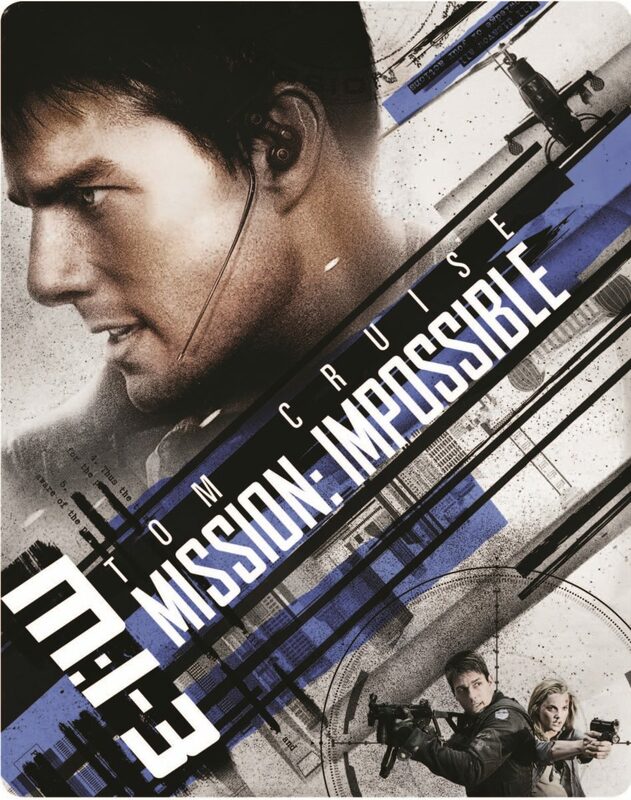 As the only survivor, suspicion automatically falls on Cruise’s Ethan Hunt, who goes on the run to clear his name. So far, so familiar. 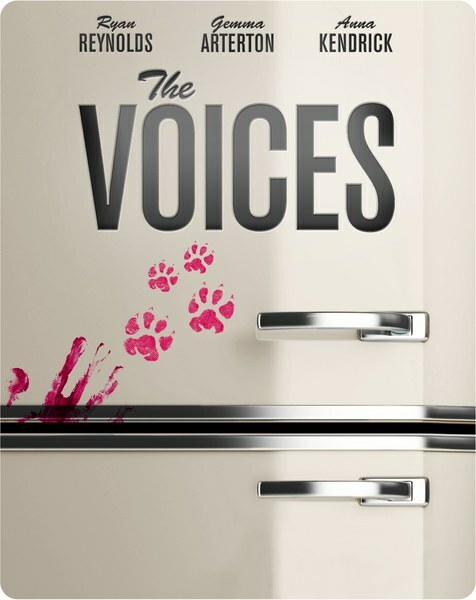 But as the stakes, the tension and the pace rise, the film evolves into one of the best thrillers of the 70s. Apart from the film’s climax, action is actually pretty light, but in several scenes you can cut the tension with a knife. The mid-to-late 90s saw an interesting shift for Cruise, as he moved away from roles that relied solely on his pretty-boy looks, and more on his actual skills as an actor. The first M:I came between 1994’s Interview With The Vampire and 1999’s Magnolia (arguably his finest performance), and the three films really show him flexing his acting chops. Since then he’s tackled hard sci-fi in the likes of Edge of Tomorrow and Oblivion, comedy in Tropic Thunder, and true-life tales like Made in America. There have been a few miss-steps along the way (hello, The Mummy), but on the whole his movies have been consistently great fun. 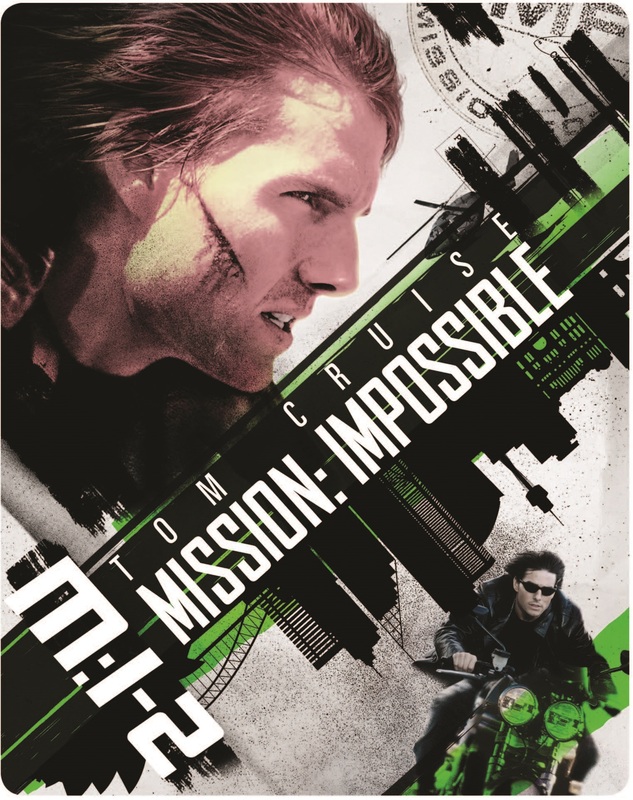 With Mission: Impossible 2, out went the finely crafted suspense and edge of seat tension of De Palma, and in came over-the-top action, vehicular mayhem, explosions and doves. Lots of doves. In slow motion. All courtesy of legendary action director John Woo. Woo is on top from here, and while M:I 2 is undoubtedly flabbier than the first, it’s still great fun. We start to see Cruise’s commitment to doing as much of the stunt work himself as possible right from the opening titles, a trend that has continued throughout the series in ever more bonkers ways. Mission: Impossible III sees the arrival of director JJ Abrams and his production company Bad Robot. Abrams and Bad Robot have stuck with the franchise, and I’m in no doubt that these behind the scenes changes have helped the series go from strength to strength. Abrams opens the film in fine, attention-grabbing form, with Hunt held captive by villain Owen Davian (a superb performance from the brilliant Phillip Seymour Hoffman). The action then shifts back in time, as Hunt and his team try to track down Davian and retrieve a mysterious item known as “The Rabbit’s Foot”. M:I III does a great job, acting almost as a soft reset for the series, giving more screen time to the larger team and our first real at the political goings on inside the IMF, bringing back a bit more of the suspense, while pulling back on some of the more over-the-top elements of the last film, and giving the action a bit more of a grounded feel. With that groundwork done, Abrams headed back to the Producer’s seat for Ghost Protocol, and made way for Brad Bird, making his live action debut. And what a debut it is. After helming The Iron Giant and The Incredibles, two of the best animated films ever made, Bird brings us one of the best entries in the series – at least until Rogue Nation. 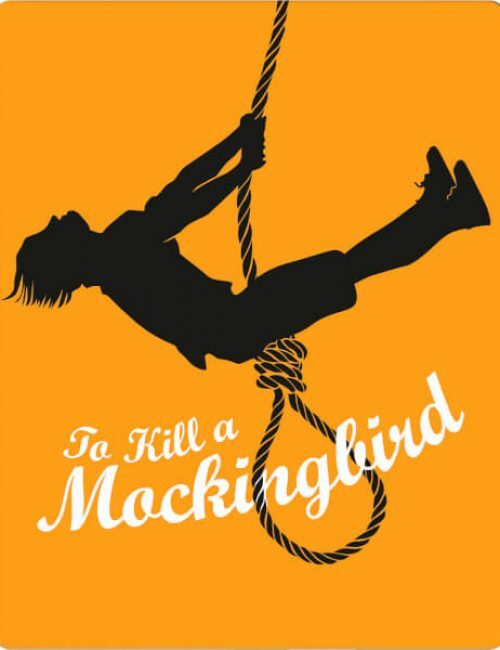 The plot is really nothing new (are they ever?) but the movie powers along, barely pausing for breath. Rogue Nation sees long time Cruise collaborator Christopher McQuarrie (his Cruise-based writing and directing credits cover Jack Reacher 1 & 2, Valkyrie, Edge of Tomorrow and The Mummy) stepping behind the camera, opening the film with his leading man strapped to an Airbus A400 in another contender for the series’ best action set piece. 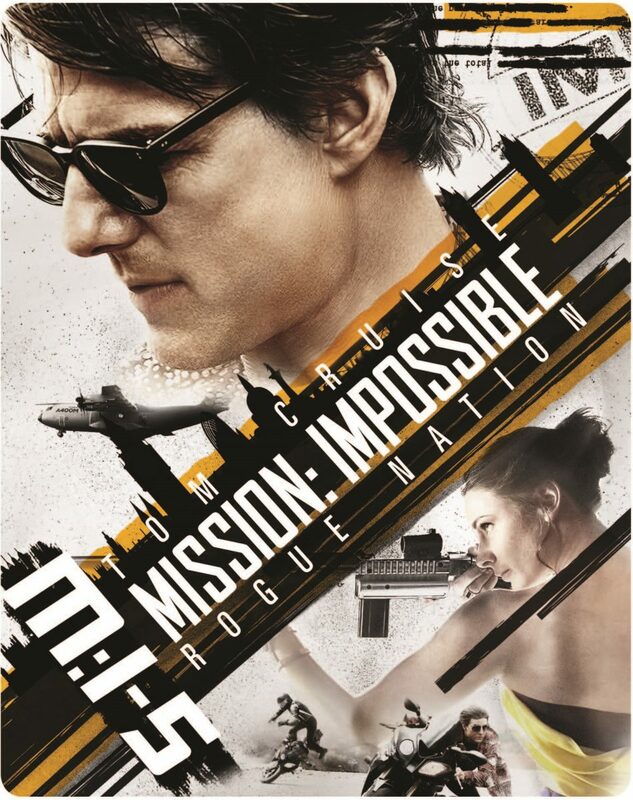 Once you’ve got your breath back, we see Ethan Hunt kidnapped by – then escaping from – an organisation known as The Syndicate, who are trying to bring down the IMF. McQuarrie has assembled a great cast filled with both returning members of the team, as well as new comers including a perfectly cast Alec Baldwin as the CIA director Alan Hunley, Rebecca Ferguson as Ilsa Faust, certainly the series’ best written and fleshed out female character, and Sean Harris as Solomon Lane, head of The Syndicate. Despite some of the series’ best action sequences – the Airbus, an assassination attempt behind the scenes in an opera house, an under-water break-in and the subsequent car chase to name a few – the film bravely ends on a more suspenseful, non-explodey note that never feels out of place. Make no mistake, this new set of 4K releases represents a significant improvement over the old Blu-rays. We get a mix of true 4K transfers and upscales, with varying – though still very impressive – results, and with all five movies being presented with Dolby Vision HDR (backward compatible with HDR10). The first two films were shot and finished on film, and have been given fresh 4K scans for this release. The results for both are generally very impressive, with many shots showing huge amounts of pin sharp detail. On the whole both films look really good, with a very pleasing film-like quality to the image. Light to moderate grain is present throughout, though it does get quite heavy in some shots and scenes. I did wonder if the occasional shot was scanned from a source that’s a generation or two away from the original negative, but that’s just an assumption on my part, and I could be wrong. There’s some additional softness in some of the effects shots, for example the climax of the first film, where the now 20+ year old VFX were completed at a much lower resolution, but that’s unavoidable. As is often the case with 4K releases, both films benefit hugely from HDR, with impressive amounts of shadow detail that is simply lost on the Blu-rays, strong contrast and a great overall visual ‘pop’ to the image that never feels too over the top or unnatural. Slight niggles aside, M:I 1 & 2 look very nice indeed, and are definitely worth the upgrade. Onto film three, and, while still a great looking release, the improvement over the Blu-ray is less pronounced. While once again shot on film, Mission: Impossible III was finished as a 2K Digital Intermediate (DI), and so what we get here is a 4K upscale. Don’t get me wrong – it still looks very good, but it’s not as big a visual leap as on the first two films. Being an upscale rather than a true 4K scan, the image doesn’t quite reach the levels of crispness and detail seen on those discs. That said, it’s still a very pleasing image, lighter and more consistent levels of film grain, and without the fluctuations seen on M:I 1 & 2. Once again HDR does it thing, with great contrast, deep blacks and bright highlights, with a nice, bold colour palette. All in all, there’s really nothing to complain about here. Film four is the best looking of the bunch here. 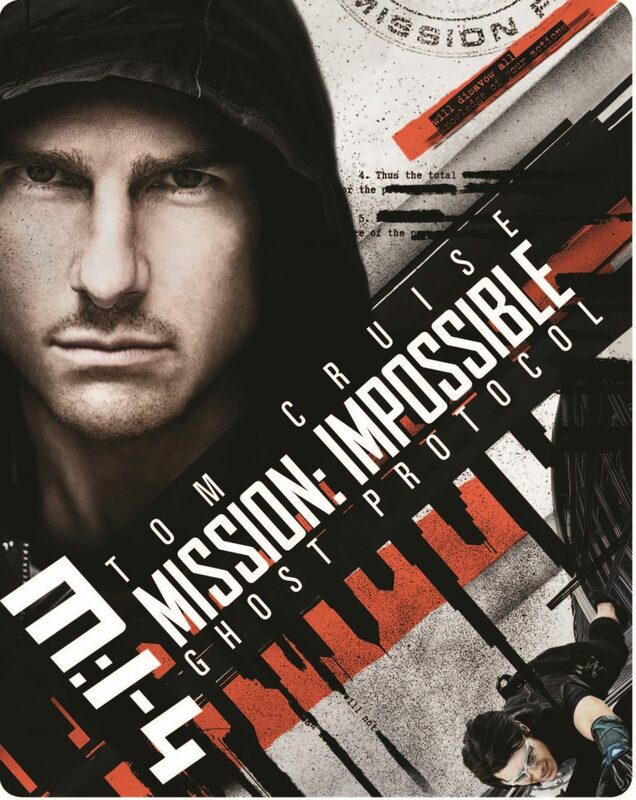 Shot in a mix of traditional 35mm, and 65mm IMAX format film, Ghost Protocol was finished as a full 4K DI, and looks spectacular. While the IMAX footage, such as the Burj Khalifa sequence, doesn’t switch to full screen 16:9 (as it does for example on Christopher Nolan releases like The Dark Knight sequels, Dunkirk, and so on), the clarity is eye-watering, and, on a big enough screen, still vertigo-inducing. The regular 35mm footage also looks pristine, with very low grain levels and loads of fine detail. HDR is on point again, resulting in a reference quality presentation that is perfect for showing off your 4K kit. Finally we get film five. While filmed on a mix of digital and 35mm, Rogue Nation was finished using a 2K DI, so we’re back to getting an upscaled release. Luckily it’s a good one, with a slight but definite improvement in detail and clarity when compared to the Blu-ray, while grain is light, and HDR once again gives the image a welcome punch. So, a mixed bag overall, but each of these is definitely worth considering as an upgrade. Believe it or not, the first three Mission films only have standard lossy Dolby Digital audio tracks on Blu-ray. Thankfully these new 4K releases fix that problem, giving the films very meaty 5.1 Dolby TrueHD lossless mixes. The sound mix on film one isn’t quite as showy as more recent action films, with rear channels being used more for music and atmosphere than in your face (ears?) direction effects. That said, the rears make themselves known when needed, while up front dialogue is nice and clear. Your sub will get a good workout throughout. The audio on M:I 2 is about as subtle as the film, and is lively from the first frame. Bass is punchy but never intrusive, while dialog, effects, and Hans Zimmer’s excellent score are in a constant battle for your attention, but thankfully never to the point where any of them get lost in the mix. This is a great presentation. M:I 3 is a little more restrained in comparison, but still springs to life regularly. Again, there are no complaints when it comes to dialog clarity, no matter how much mayhem there is on screen. Once again, effects are well placed around the sound stage, with a good bass kick when needed. Ghost Protocol already has a great 7.1 Dolby TrueHD lossless mix on Blu-ray, and that’s carried over to the 4K disc. As with the image on this film, the soundtrack is real demo stuff. Everything you look for in a soundtrack is present here – with clear dialog, pinpoint precision when it comes to use of the soundstage, and strong but controlled bass. Strap yourself in, turn up the volume and enjoy. Finally, Rogue Nation also carries over the existing Blu-ray audio to the 4K disc. This time it’s a Dolby Atmos track (fully backward compatible with standard 5.1 Dolby TrueHD kit), and again it’s an absolute belter. The height channels do a great job in the action sequences – the opening sequence with Cruise hanging off the side of a plane is an obvious highlight, as the room is filled with sound – but also handle more subtle atmospherics throughout the film. It’s one of the best Atmos tracks you’ll hear, and real show-off material. As usual, extras on the 4K discs are pretty thin, limited to just audio commentaries on films 2, 3 and 5. Each package also includes the movie on Blu-ray (just the same ones previously released, in fact), and those are where you will find the rest of the extras. As well as the usual selections of deleted scenes, trailers, TV spots and photo galleries, we get several hours of behind the scenes featurettes across all the discs. Much of it is fairly standard EPK stuff, but all of it pretty interesting. Especially good are the bits covering the Burj Khalifa and plane sequences from Ghost Protocol and Rogue Nation respectively, which go to great pains to show that – yes – it really IS Tom Cruise literally hanging on for dear life. 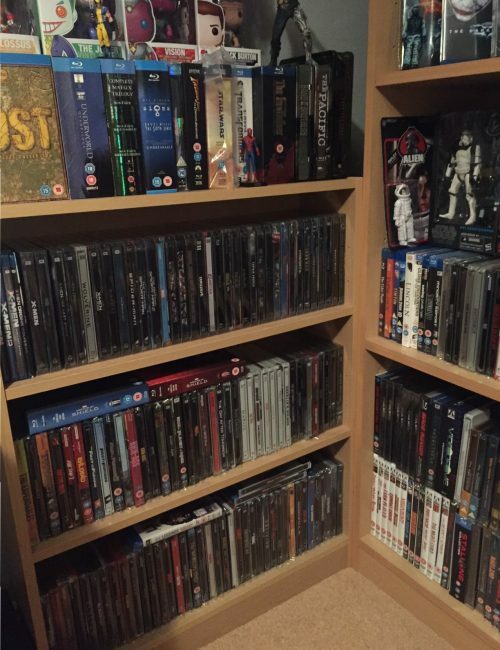 Say what you like about him off screen, but there’s no denying you get your money’s worth when you watch one of his movies. These new 4K releases are available as a set of five matching steelbook releases, with very nice, stylish artwork. The consistent design style works really well across the set – here’s hoping that the new film, Fallout, gets something along the same lines. It’s a rare franchise indeed where the films get better as they go along, but the Mission: Impossible series really has gone from strength to strength. Early reviews of Fallout suggest that the trend is set to continue. The video and audio presentations on these the 4K releases are top notch, and well worth the upgrade. Finally, the matching steelbook art is very slick, and will look great as part of any collection. Click here to buy all five movies for £25 with Zoom’s special offer. I don’t remember MI: Ghost ‘Recon’ ?